At a meeting of the G20 world’s richest nations met in Moscow to discuss food security, the Anglican Alliance set out the challenges facing smallholder farmers in Africa and described the church’s work in tackling hunger and poverty. Meanwhile in Solomon Islands, the Anglican Alliance’s ground-breaking World Food Day workshop inspired a group of women farmers to take action to set up an association to win a better deal for small farmers. The Anglican Alliance held the first World Food Day celebrations with a workshop in Honiaria whilst in Brazil, the Alliance teamed up with the landless people’s movement to consider food security, and in Bangladesh a workshop is to look at the impact of climate change on smallholder farmers. In Moscow Anglican Alliance Director Sally Keeble made the food security presentation to international institutions including the World Bank and World Food Programme, G20 countries including Japan, Germany and the European Union, and non G20 countries including Tanzania and Nigeria. The move fulfilled the mandate given by the Alliance’s founding consultation in Nairobi in April 2011 to speak out to the world’s richest countries on the scandal of the 900 million people who go hungry every day. The Alliance made the case for more support for smallholder farmers in Africa and other developing countries, and for the role of civil society, including the Church, to ensure support gets to the local communities, and especially to women farmers. You can read more about the event elsewhere on the Alliance website. At the ground-breaking Alliance workshop in Honiara, Solomon Islands, the 11 women participants took action to establish a ‘Rural Women Farmers Association’. Through Anglican Alliance workshops they learnt how to access the tools that they need for their economic empowerment and health and wellbeing. Two days of workshops were held for the women. For some it was their first encounter with education and training, and with information about climate change and its impact on their agricultural work. They were so empowered as they addressed the key issues they face, that they decided to set up the Association to give them better access to the markets, access to new technology, and access to land. As rural women, they are eager to raise their voices and fight against the gender issues that they also face. The workshops were a great success, and brought the women together with local professionals and legal advisers to share learning and build capacity. Every participant had the opportunity to share their own experiences of agriculture before hearing more from the experts in the sector. Key areas for discussion included the impact of climate change on farming in the region, and the ways in which local and national governments were addressing the issues. This was remarked upon as one of the highlights of the day as some participants had never heard of climate change before, how it might affect them in their work, and what could be done to address the issue. Agricultural practices were also shared, with participants having particular interest in the practice of crop rotation. These were skills that they had never been taught before, which means they have previously been planting the same crops every year, depleting soil nutrition and resulting in poor yields. With this new knowledge they can now plant different crops, get a better yield, and putting nutrients back in to the soil, for more sustainable farming. And they had the opportunity to hear from professionals on their access to markets and how to price their stock. A legal officer was also present to discuss land rights and the systems in place to help them gain access to land. This particular presentation made policies and the legal framework surrounding access to land approachable to the rural women, and provided them with the information they needed to know who to talk to and what to do when they wanted to buy their own land. After the workshops, a communal event was held by the Mothers Union in Honiara to mark World Food Day. Everyone was invited to the Cathedral to celebrate the regions unique and vibrant food, pictured above. Food demonstrations were held and attendees were shown how to make the most nourishing meals with their local food supply. And food preservation techniques were also shared to help locals to save their food and prevent its decay. Anglican Alliance board member George Kiriau praised the event, which was the first ever World Food Day celebration to be held in Honiara. 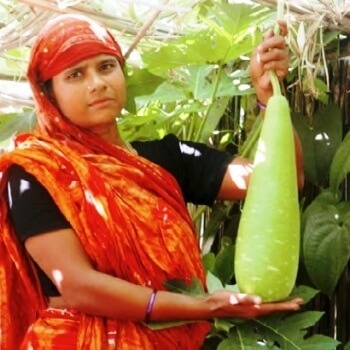 In Bangladesh smallholder farmers have been invited to attend workshops that will address the changing climate the impact on their livelihoods. The Church of Bangladesh have produced a banner, pictured on the right, to highlight the event. Next year Pacific Anglican Alliance facilitator Tagolyn Kabekabe will lead the Alliance global advocacy on food security when the G20 is hosted by Australia in Brisbane.